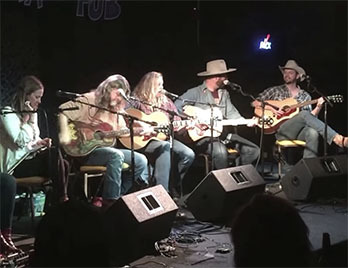 The Red River Songwriters are a group of Central Texas-based performing songwriters who started a festival 8 years ago that takes place in Red River, New Mexico. It always happens on the last weekend of January, guaranteeing all visitors good skiing and warm places to gather to listen to the hosting group of writers and their guest performers. Susan Gibson is one of the most respected touring songwriters in the country. She’s also known for penning Wide Open Spaces, the huge hit that launched the Dixie Chicks career. She hosts songwriting schools and tours constantly, everywhere.